Exchange with Angele discusses kidnapping as possible child abuse. Exchange with Angele are reproduced excerpts of our email exchange. They are posted here so that my visitors can identify how their own personal situations can fall under the definition of emotional child abuse. Angele was referring to kidnapping as a form of child abuse. She lives in Toronto, Ontario, Canada. You can find Angele's Story on this site. Was wondering why you do not have anything in your site on kidnapping? If I am to ever live I really need help with this while my mother is still alive. From a past middle age woman who feels like a child stuck back there. I don't specifically refer to kidnapping on any of my pages because there are way too many variables associated with this type of situation. Kidnapping your own child has yet to be recognized as a form of child abuse (not that I don't see some cases as abuse, yours in particular). Not all children who have been kidnapped by a non-custodial parent are being abused by that kidnapping . . . a lot depends on the circumstances surrounding the reasons behind the kidnapping--some children are being removed from an already-abusive environment, such as sexual or physical abuse. But regardless of whether or not kidnapping 'officially' falls under the category of abuse, many of my pages still apply and provide the information you may be seeking. 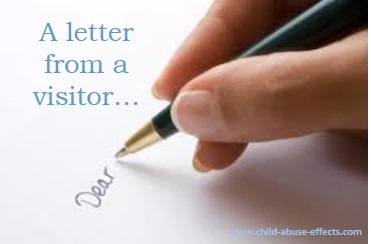 When child abuse of any kind occurs--sexual abuse, physical abuse or child neglect--emotional abuse is ALWAYS present. But the 3 other forms of abuse do not have to occur for emotional abuse to be present. That's why emotional abuse is considered the cornerstone of the abuses. When your mother took away your brother and sister, and left you behind with the bitter man who was your father, it was neglect. On top of that, she not only robbed you of a relationship with your siblings, she also left you to wonder why she didn't care enough to take you along with them. What she did to you was emotional abuse to the umpteenth degree. You not only suffered the effects of separation from a parent and siblings, you also suffered the ongoing effects of the emotional abuse that was attached to it. Your mother betrayed your trust with her heartless selfish act, and it was this betrayal of trust that has likely caused the most psychological harm. The fact that she is back and meddling only serves to re-open the wounds that barely even scabbed over. My heart truly bleeds for you, Angele. You deserved, and still deserve, so much better. There are several pages on my website that reflect the signs and effects of the abuse you suffered through. As I continue with this response, I will include the URLs of the relevant pages that you can click onto, assuming that's what you want to do. I'll start by pointing you toward page at types of emotional abuse. The kidnapping your mother resorted to falls under a multitude of categories. "Rejecting" is the major one. "Isolating" is another. "Ignoring" is yet another. I would venture to say that "Terrorizing" is yet one more. The signs and effects of abuse of any kind are related, so I suggest you check them out. Signs of child neglect page define the basic needs. In your case, you were robbed of emotional needs. I want to thank you for your comments, Angele, and for allowing me to post them. While I have not included kidnapping as a form of child abuse, I have included what kind of child abuse kidnapping would be, if it were to be classified as abuse, such as in your case. I wish you all the best, Angele. I thank you from the bottom of my heart for your compassion Darlene and for the links (just opened email so have not had time to research yet) and your understanding. Perhaps only those who have experienced can ever really comprehend? Humongous Kudos to you Darlene for 'healing' yourself.